Stride (Released when both players' vanguards are grade 3 or greater! )-Stride Step-[Choose one or more cards with the sum of their grades being 3 or greater from your hand, and discard them] Stride this card on your (VC) from face down. [AUTO]:When this unit placed on (VC), if you have a heart card with "Ancient Dragon" in its card name, choose one of each player's rear-guards, retire them, and increase this unit's [Power] by the sum of the original [Power] of the units retired with this effect until end of turn. 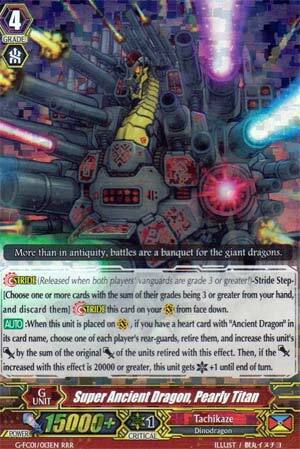 Then, if the [Power] increased with this effect is 20000 or more, this unit gets [Critical]+1 until end of turn. Not the best, but since I can't say a lot that's interesting about the others (apart from the ones I picked this week) let's go with the more interesting of the lot. Pearly Titan, on Stride, retires a rear-guard on both sides, then gains power equal to the total power of the units retired. If you gain 20k power this way, he also gains +1 critical. But you need an Ancient Dragon heart to do any of this. It's nice, but his power requirements are too steep to get the most mileage out of him. Assuming you want to combine this with units that revive upon getting eaten such as Iguanocorg, you're never going to gain enough power to actually gain a critical, so it basically becomes a +1 for a CB1 cost with a bit of redundant power. In fact, the only normal way to use him at max capacity is to retire an 11k base rear-guard on the opponent's side (so a spare Grade 3) and Tyrannobite, a 9k Grade 2. Otherwise, it's working out as a 1:1 for you with an on-hit effect, which would probably work out better than something like Efnysein, but I'm still not sold entirely on it. Just hope the next pack with Tachikaze in it is a bit kinder. So, Ancient Dragon stride, huh? When you place on V, you retire one of your rear guards and one of your opponents rear guards to increase the power of this by the combined power of the retired units and if you increase by 20000 or more, it gets +1 critical. Easy enough to do, retire a Grade 3 and a Grade 2, that should, generally speaking, be 20000 power. If you can't get the +1 critical, it's always nice to retire troublesome rear guards, like Commander Laurel, starters that haven't been used yet, cards like Dorint or Bruno which make rear guard lines very hard to guard against. Over-all, fairly simple and straight forward, which is very nice. Also, in a Tag Fight, you retire one of yours, your partners and both of your opponent's rear guards, making getting to 20000 stupidly easy. Plus Ancient Dragons do nothing but gain skills when retired from the field, so, that's always nice. Bottom line, use it if you're running Ancient Dragons.